Your car's exhaust system plays a critical function. This system channels the harmful exhaust fumes away from the cab and out into the air. 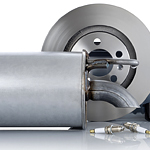 At times, the exhaust system can leak, and this can lead to an unhealthy situation. There are certain warning signs that you will want to look for that indicate that the exhaust system might be leaking. If you hear hissing and popping noises from the exhaust, that is a sign of an exhaust leak. Exhaust leaks may also cause your vehicle to experience heavy vibration. A significant reduction in your vehicle's gas mileage can also be an exhaust leak warning sign. If your vehicle is showing some of the warning signs of an exhaust leak, bring your vehicle to Tim Short Mazda. The professionals in the service department can diagnose an exhaust leak problem, and they can provide the repairs that are necessary to get your vehicle operating correctly.